Crush the Hobnobs and mix with the melted butter. Use them to line an 8 inch (x 1½ deep) sponge tin. Refrigerate to set. Using a zester cut the zest from two of the limes and set aside. If you don’t have a zester cut the zest from the limes with a peeler and cut into fine strips. Grate the zest from the other three limes with the fine side of the grater. Squeeze the juice from the limes. Mix together the condensed milk, cream, grated lime zest and juice until it thickens. Pour into the biscuit case and refrigerate for two hours. 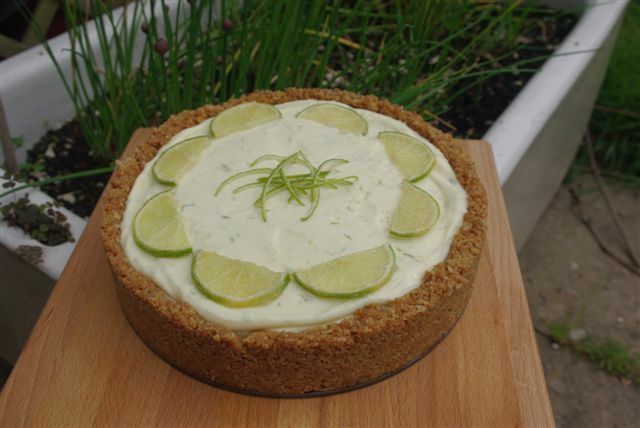 Toss the strips of lime zest in a little caster sugar and use to decorate the top of the pie. Thin slices of lime can also be used for garnish.